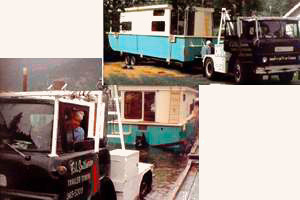 big trailers and porches. Pilot car service is also available. VALUE STATEMENT for F.J. SMITHERAM TRAILER TOWING LTD.
- Training and ongoing support available at $25 per hour for up to one year. - Lease outside area for storage of equipment. - Telephone and computer operate from seller's home. *NOTE TO READER: PIN provides a Value Statement. This is done for advertising purposes. These are numbers given to us by the client. We arrange these numbers into a formula. Pin does not know if the numbers are correct or what ratio should be used to determine the value or defence of value. That has to be determined by your accountant. Financial Institutions will only consider documents certified by accountants. *Additional Note to reader-The business has been around since 1966. 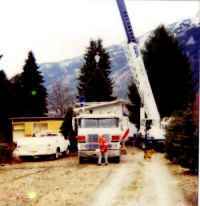 This houseboat was moved from Castlegar (Kinnard) to Syringa Park Marina where it was launched. This was moved on a 28' structural steel flat deck especially suited to the load. 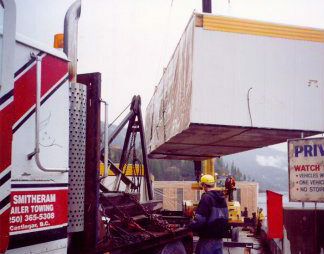 This floating platform was custom built at Scotties Marine, transported to Kootenay Lake, launched and utilized as work platform for a heavy duty crane. The task at hand was to assist a land based railway crane extract locomotives out of the lake after a derailment. The locomotives had fallen into the lake at Kaslo. Tying a Belt Slinger to 14' wide spreader frame (preinstalled prior to transporting) to lift off first half of 14' x 52' doublewide. GWIL 60 ton Link Belt crane is readying for the lift. 60 ton Link Belt Crane has completed lift and transfer to trailer bed. 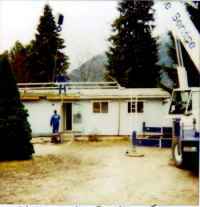 This unit was transported for Peter Kiewit and Sons during their stabilization project of 7 mile dam, on Pend Oreille River Dam, for earthquake resistance. 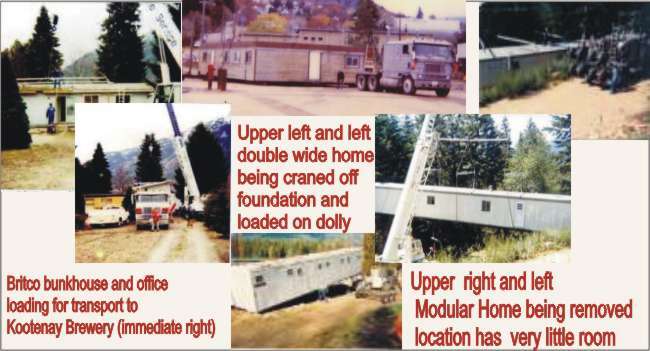 Transport of a double wide 1999 Northern Office Module from construction site. The module is being lifted off F.J. Smithram dollies to its temporary foundation. The surrounding terrain is rough and uneven. F.J. Smitheram has hauled the module to the site and is now levelling and blocking both units. Please visit www.castlegar.ca for information about the community.